The Honor Foundation's SOF for Life Transition Program helps Special Operations Veterans find meaningful employment after active duty. They aren’t prepared to find and keep meaningful employment after they leave the military. While the survey results report gaps in physical well-being, mental health, and medical benefits for respondents, the SOF for Life program was developed to focus on the career and financial preparation gaps. 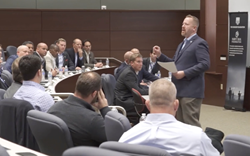 The program is supported by both the Global SOF Foundation and The Honor Foundation, as well as AAFMAA--which provides participants with wealth management support. The Seminar takes place on the first day of the 2018 Global SOF Symposium - US, which is hosted by the Global SOF Foundation annually at Innisbrook Golf and Spa Resort in Palm Harbor, Fla. This year's event will kick off on President's Day, Feb. 19, with the SOF for Life Seminar, the Global SOF Golf Tournament, and a welcome reception. A packed agenda of Symposium events will follow from Feb. 20 to 21, and will include engaging speaking events and an abundance of networking opportunities. The Global SOF Foundation is a 501(c)(3) non-profit organization and the only professional association for the international Special Operations community. The Foundation mission is to both advocate for SOF resourcing and convene the SOF community.